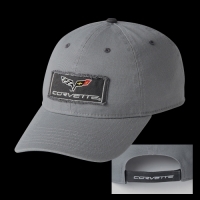 C6 CORVETTE FRAYED PATCH CAP - LOW PROFILE, GARMENT WASHED COTTON WITH FRAYED PATCH. VELCRO CLOSURE. COLOR: CHARCOAL. IMPORTED.